Master Reviews Category. All topics are broken down into their proper item below this. Readers of my PiercingMetal.com site know full well that I see a LOT of concerts with journalistic intent in mind but it is rare that I am actually the guest of another provider of similar entertainment. I sometimes kid with my fellow media peeps how my simply going to a show to just “enjoy it” was difficult and that I always felt compelled to bring some kind of visual image or story to the masses after the fact no matter who it was. 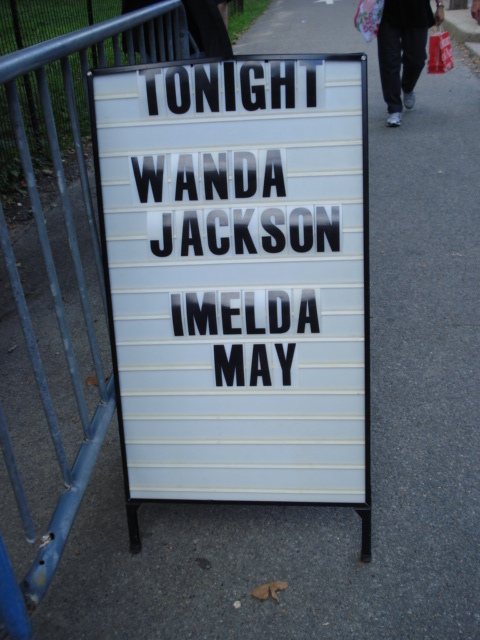 That being said when our own Skeleton Pete was preparing to cover the Wanda Jackson/Imelda May show at Central Park’s Summerstage for his eponymous blog, I was more than happy to be the guest that came with his credentials. The show was free for this particular outdoor event, but there are ones that are pay to enter. Here is the marquee for the show. 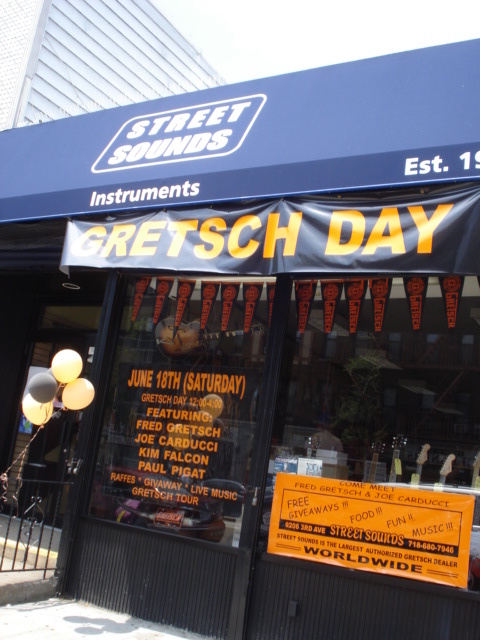 Just last week Bay Ridge’s own Street Sounds Music celebrated it’s annual “Gretsch Day” and for those fans of the wonderful instruments that come care of this fine company, this was the place to be on this almost Summer afternoon. Street Sounds is cited as the world’s largest retailer of these guitars and when you see the collection they offer you as a musician you can see why this is the case. This will be the third event of its kind being held at the location and it was going to be a fun filled day of special guests, food, prizes and music. Today was also the annual Mermaid Day Parade out in Coney Island but I felt my time was better spent socializing and reporting on this event. So read on dear readers and hopefully feel like you were there with us. The store was decorated up for the event with signs whose bright colors welcomed all passerby. Here’s a shot of the shop owner Rocky Schiano and guitarist Paul Pigat. Next up a little better view of today’s musical menu. As you can see there would be appearances by Fred Gretsch and Joe Carducci along with Miss Kim Falcon. 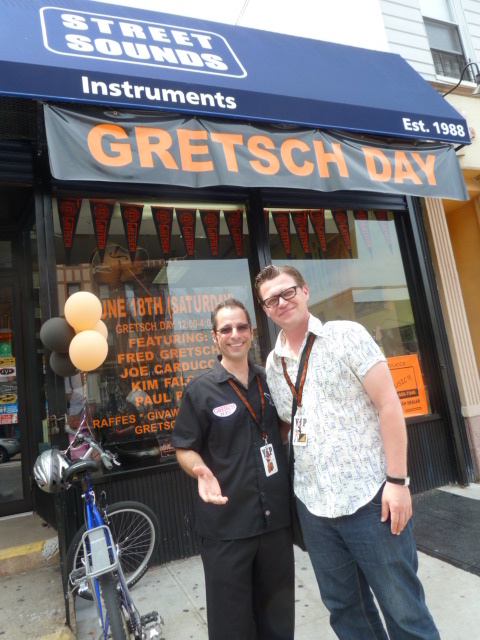 Fred Gretsch III actually was responsible for reviving the company a little over twenty years ago and Joe is their product specialist while Kim is their official spokes model/calendar girl. Now that you know all of these details we can continue along. Readers of my music journalist adventures and narratives who are keeping tabs of what I do over on PiercingMetal.com and its companion Blog are probably already fully aware of my recent outing to the Blogworld & New Media Expo 2011 which was held at the Javits Center on Manhattan’s West Side this past week. 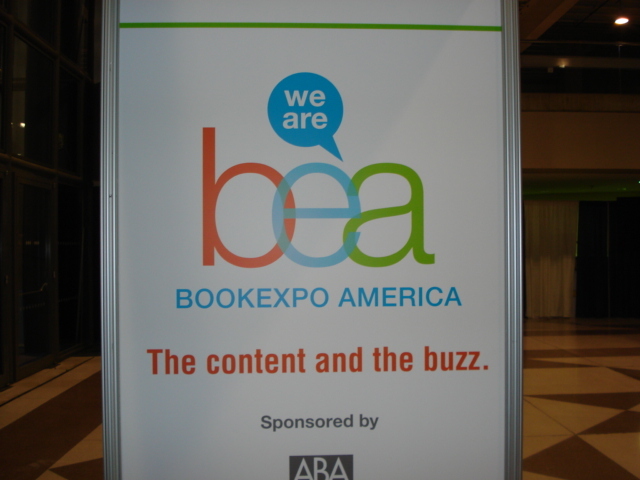 I attended said convention for the exhibition floor only in order to see what I might learn as a person whose brand is firmly entrenched in the world wide web and its Blogosphere. The Javits Center as an event space was no longer new to me as a media scribe for I had been on point to cover 2010’s NY Comic Con and Anime Festival as well as the absolutely incredible Toy Fair 2011. Many years ago I pursued the challenging career of working musician and while I did achieve some local notoriety in bands from the region such as Eclipse and eventually Machine after them, I did not stick to the plan proper and remained more of an occasional jam here and there. Maybe a blog in the future will discuss that bit of adventuring. One of the dudes from my way back years is Rob Emery and reconnected a number of years ago and since that time I have been supporting his project that is entitled “Ragtag”. Sometimes the band sports an “NYC” after the name but I have not seen that lately so perhaps it has been omitted for good. In any event, Ragtag is a three piece Rock/Funk outfit with Robbie singing and playing some serious axe while Alan Chan grooves on the bass and Sinehead Doug locks it down on the drums and 2011 finds the band celebrating being together for ten years. They play a mixture of originals and covers on any given night. I hit the recent gig at Sullivan Hall in NYC which is a venue I like even though they don’t really do much Metal over there. It’s a pleasant change of pace and even though I was not “working” my usual role as journalist and photographer, I did use my Panasonic Lumix to snare some video which I am sharing with you all. I figured this is a fun little side thing to offer readers of the PiercingKen blog, so let’s see how much more comes in the future. The video posted is a performance of their original number “Not Long Ago”. Congratulations Ragtag on your ten years of making music together. I raise a glass to you my friends. Keep on rocking. Even though the PiercingKen blog is only a few months old, its pretty safe to say that most of its readers know that I am a massive fan of the live concert scene and that some of my side musings might be about music as a result of that. I will try to keep them to ones that really don’t make much sense for the Official PiercingMetal Blog though. So resultant of my keeping a comprehensive event calendar I happened upon this rather amusing listing. It was the kind of thing that just had to have a screen capture taken of it. Take a look. You are not imagining this and of course seeing it very clearly but please know that it is a mistake listing. If it was not, I am not sure what planet a headlining set by The Killers Brandon Flowers would have had Children Of Bodom opening, but it was amusing to see nonetheless. There was a hot minute that fans and I were fooled since we didn’t readily know the singer of Killers name. Its not the kind of stuff the general Metal fan knows off the top of their head. I did send a link to this to some industry insiders to be on the safe side because if it was happening I would have had to set up coverage of the Finnish openers. That being said I leave you to your regularly scheduled programming. See you again soon.